yourPrint.in lets you customize and create your own photo printed sippers and bottles easily, within seconds online and get it delivered to your home or office. 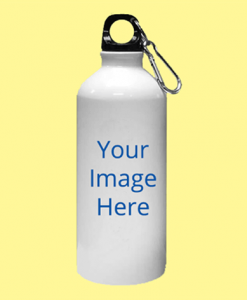 The bottle/sipper can be printed with your image/design/text and the print is clear, permanent and stays forever. Make your sipper truly unique with our range of personalized water bottles available at affordable prices online in India. You just need to select your product, upload your picture and the sipper will be printed with your design. Personalized Sipper Bottle - your best companion at Gym! If you are a workout freak, you know the importance of keeping yourself hydrated at workout sessions. With our range of personalized printed sippers and bottles, which are made up of lightweight and high quality metal, you can keep yourself fresh and hydrated during your exercise sessions in gym or playground. The water-bottles are made up of durable metal material and keep your water / protein shake cool and fresh inside them. Flaunt your style with the cool water bottles and sippers from yourPrint. You can order them in various sizes and colors online. Photo Printed Water Bottles & Sippers - the perfect Gift! Without doubt, these printed water bottles are the perfect gift to give to your loved ones, friends, employees and business partners. If you plan to give the bottles to your employees, you can customize them with your company's logo in unlimited colors. 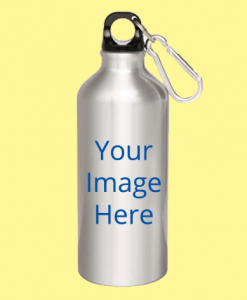 If you wish to gift these photograph printed water bottle to your loved ones, you can customize them with your images and add any message by adding text on the bottle and sipper. The print is permanent and stays on the bottle forever. Our photo printed sippers offer the ultimate style and make you look cool in front of your friends and family! Stand out of the crowd by creating your own products with our easy to use interface. We deliver to all pin codes in India and Cash on Delivery is available on Selected Pincodes in India. Get the best customized sippers in India at yourPrint website and app.